1 or 0. Aye or nay. It’s that light. When it goes on, the Congresswoman is on the record. She will tell you that she didn’t start kissing babies just to end up suckling the corporate teat, but in the end, she will protect her seat from exposure, and her true and principled beliefs will disappear behind a vote that is neither, all with the push of a switch. The power behind what makes a politician place that vote can be generated from a significant, real and unlimited source – the people who they were elected to represent, but the button they usually end up pushing – with an audible thud – is powered by a virtual, unauthentic, and mortal poser, corporate money. 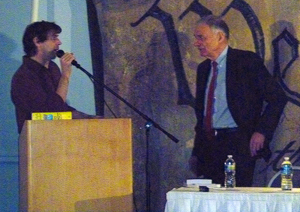 The Backbone Campaign's Bill Moyer thanks Ralph Nader for his appearance at the For the People Summit, Saturday, January 22, 2010. Nader was speaking at a summit held January 21-22, 2011, in Washington, DC, for a group of national movements who came together to recognize, primarily, the first anniversary of the Supreme Court decision in the case, Citizens United v. Federal Elections Commission, which legitimized direct donations from corporate entities, effectively giving them the same rights to speech as any citizen, in the form they have in more abundance than almost any single individual – money. The goal of the event, called Movement for the People, was to discuss ways to throw open the door, to lift the blinds on the prevalent, institutionalized influence of corporate money on our legislative – and even executive – branches of government. Also, of course, to come up with strategies for overcoming the unfair influence on policy that money brings. “Cultivate a culture of resistance” to corporatism in our government, health-care activist Dr. Margaret Flowers advised the gathering on Saturday. The idea, speaker after speaker said, was to recognize that those who move to endorse, improve and advance the consolidation of corporate power in government, are the enemy of every American citizen. Whether you are liberal or conservative, control of your representatives is being compromised. One speaker even said that whether you are voting for a Republican or a Democrat, you are voting to strengthen corporate power, not weaken it. It can be a crisis of conscience, wondering if you’ve thrown away every vote for federal office you have cast. Certainly, corporate influence has worked its way into even the best achievements of this administration, and possibly dominated the worst. Too often we choose our candidates with the same cognitive dissonance with which they run. They know what’s waiting for them in Washington, and, sadly, so do we. For the mainstream body politic, like Congress and the two main political parties, what’s waiting for them is institutionalized power, and power means money – the ability to solicit it and do favors for it. For the monied corporate interests, the equation flips, and money means power. Which ever side of the money/power equation they are on, together they aim to keep, stable and predictable, a government run by the rule of corporations. If they cannot maintain that insular status quo, the shadow government they have hoisted onto the Capitol building – and House and Senate offices – will sink the entire toxic process into the marshy shallows of the DC tidal basin. It has no business standing, other than the artifice of corruption makes it so. By legitimizing the corruption, as SCOTUS did in the Citizens United case, another patch of steel reinforces a structure that, by all rights, should be collapsing under its own weight. 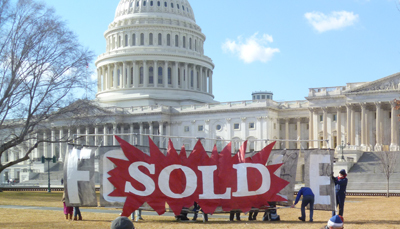 Unsupported as it is by what the Framers intended when they created the Constitution and the Bill of Rights, the sanctioned corruption of all three branches buries the intent of a government of, by and for the people, behind a glitzy, neon “SOLD” sign. Still, the Congresswoman, the Senator, the party leader, they are all acting on their political instincts – the uncontrollable behavior that calls them to the meeting, the cocktails, the tee time – leading them to the enticing salt lick like a deer at an NRA “fact finding” expedition. No, no they won’t get the better of you, because when the smoke that follows their shotgun blast clears, you’ll still be enjoying your largess, and the people who you’re screwing will be writhing on the ground, wondering what happened to the people’s America. Perry’s video about the folly of corporate personhood, produced for the Movement for the People Summit. Love the video PG. Well done!